In addition to Workshops, Software and script Submissions, we offer a few additional services, as well. 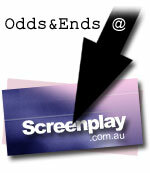 A dynamic FREE screenplay development program where the best scripts get produced! The inspiring new book that lays down a simple, step-by-step approach to writing. It's like having your own personal expert to guide you as you write your screenplay. A monthly audio series on CD. And the best (and most cost-effective) way to continue learning and to stay inspired! Do you have a school, a writer's group, a convention or function? Want a "passionate", "empowering", "dynamic" speaker to "light a fire" under them all? Have something you'd like to see that's not on the website? Let us know!